Members of the Student Union opened the Board of Trustees meeting this morning in the Daniel Family Commons. Early this morning, the Board of Trustees prepared to meet in Usdan’s Daniel Family Commons (DFC). Also in attendance was a group of approximately 35 students, many of them members of the Student Union, who had not been invited. 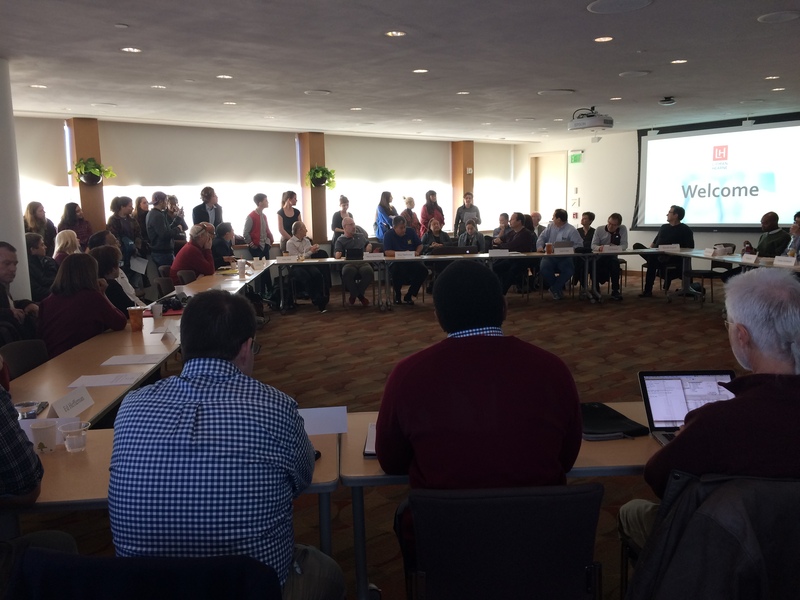 The Board’s proceedings were closed to students other than a handful of members of the Wesleyan Student Assembly (WSA). Students sought to open the meeting in a demand for transparency and accountability. Abby Cunniff ’17, a member of the Student Union, explained the Union’s goal. “The action is simply to make this meeting public, and for them to understand that there’s the potential for us to do this at any other meeting,” she said. Upon the students’ arrival in the lobby of the DFC at around 9 a.m., Vice President for Student Affairs Mike Whaley explained that although students could wait in the lobby for the trustees and would have the chance to talk with them on their break at 11 a.m., the meeting would not proceed if the students entered the room. Because the main doors were closed, students filed through the serving area of the DFC and lined the perimeter of the room. “In light of recent administrative inaction in the face of racism and misogyny on campus, as well as previous demands of University transparency and accountability, we demand that all Board of Trustees meetings be open to the public,” Cunniff announced to the room. Donna Morea ’76, Chair of the Board, thanked Cunniff for her comments. When Cunniff informed Morea that adjourning the meeting would be the Board’s decision, University President Michael Roth ’78 officially ended the meeting before it had begun. As the trustees exited the room, some students lingered to form a plan; others followed the Board members to their next location, which at that point was unclear. Students soon caught up with the Board of Trustees in the Public Affairs Center (PAC), where they again crowded into the room. Leaving PAC, an administrator approached Prine. “This Trump election has been hurtful for everybody, and this is making it worse for me,” the administrator said. Another trustee, an alumnus of the University who preferred not to be named, explained why he believes the meetings should remain closed to students. The trustee expressed frustration at the students’ insistence on listening to the meeting. In Usdan, where a Wesleying livestream of the two halted meetings was projected onto a big screen, a group of students composed a press release about the morning’s events. Mira Klein ’17 guessed that the trustees had adjourned both meetings because of their reluctance to set a precedent of opening them. Sarah Lurie ’17 was also frustrated, and not because they had intended to deliver a message to the trustees. Indeed, the students in Usdan grappled with feeling that the trustees had simply missed the point of their action. Close to noon, Prine provided an update. On Sunday, Nov. 20, Morea provided a statement to The Argus. “To conduct university business, the Board must be able to hold meetings with its duly elected and appointed members,” Morea wrote. “Yesterday, the Board was forced to adjourn the meeting to an executive session held in a different location. Executive session precludes attendance by student and faculty representatives to the Board, so the students who interrupted the proceedings this morning reduced the input that Trustees usually are able to receive. Student voices were absent from the room and our discussions of important issues were cut short. You made no point at all. If you want to engage in discussions with the board, you must do so in good-faith and in a reasonable manner. Just because you want to be heard, you do not have the right to control and participate in every decision of the Board. The Board can go f*** themselves. When they say, “the best interest of the university,” they are justifying why they prioritize Wesleyan’s reputation over transparency and protecting their students. The patient’s should not run he hospital. There are student representatives in the meeting. You could easily ask one of them what was said. Not every power structure needs 100% transparency to its constituents. The Board also just moved to make Wesleyan a sanctuary campus, but I guess that doesn’t somehow qualify as protecting students? The Board has a fiduciary responsibility to the University. They have a select group of students attend who have an understanding and respect for this. They then have a meeting for discussions with all students. It is an appropriate and responsible way to run these meetings. I guess I don’t know what you are trying to accomplish except to disrupt things for the sake of disruption or you are just clueless to the importance of conducting these meetings in this manner. And by the way, I think Roth is an idiot and the Board is feckless. Oh, great. The only adults who aren’t completely in the tank to the administration and you drive them off campus. Grandstanding doesn’t produce results. It may give some satisfaction to the grandstanders but that is all. It is unbelievable,if not patronizing, much less irrelevant, for an administrator to tell students, “This Trump election has been hurtful for everybody, and this is making it worse for me.” Trump has nothing to do with the meeting. That individual should be required to resign his administrative post. Wesleyan’s board is so large that if can not function effectively as the total group. The power lies with the Executive Committee. So you disrupted a ceremonial meeting thinking you were actually dealing with the decision makers. What the students were really grappling with was the inkling that their attempt to make a “point” was self-indulgent and childish.